What an incredibly complex confusing and treacherous month. It can be safely said that 80% of the activity is almost totally kept from the public. The financial system is breaking in an accelerated fashion. Compare to some grisly horror movie where a man is strapped in a chair. The more he moves, the tighter the bindings pull on his gasping throat and pressed nether stones. The most significant two factors at work are the Iran sanctions and their powerful backfire, and the futile efforts in Europe to stem the banking center collapse. The anti-USDollar federation that spans widely across the globe is gathering strong momentum. Financial aggression is being met by financial alternative development. As Greece moved off the daily news fabrication factory, the reality of a collapse in Spain and Italy has moved to the front center of observations. Meanwhile, the American nitwits continue to argue over Quantitative Easing when it never stopped, and in fact, went global under their noses. The US news machine, dominated by the syndicate, churns out absurdities after more nonsensical bites on an economic recovery. The subprime loan machinery has ramped up. The retail factor does not tell of strength, but of weakness. Spending on consumption does not indicate strength, but a path to ruin still not well recognized. The gap between reality and reports is diverging. Back at the gold desk, another cartel member kill is in progress. A string of UBS-type gold arena deaths is the biggest untold story of the new decade. The UBS rogue trader story was a total fabrication, written and staged to conceal the removal of all UBS gold from their reserves inventory. They are a dead gold player. The gold community, even LeMetropole Cafe and GATA, appears to be missing the coalition kills taken place in sequence with each paper gold ambush. If the cartel wishes to drive down the paper gold price, then they must deal with the consequences of having one more cartel member bank offered on the physical altar in a death sacrifice. They are vulnerable from sovereign bond positions and weak currency positions. In the margin call vise, they must forfeit their gold, but in a long slow process as truly enormous physical gold orders are being filled over a pyramid of prices lower than the cartel bank wishes. Details are scanty, but the trail can be followed to some extent by false stories to cover the damaging tracks. The press did a wretched job in checking the facts on the UBS rogue story. The loss was over $6 billion. The trades were all approved at VP level. The trap was laid and UBS entered with both feet, the consequence for which was being expelled from the gold arena, probably forever, in a total loss of its gold bullion. No wonder the press did not report the actual story. It would have been a monster bull story for gold. If Barclays or Royal Bank of Scotland or Bank of America were having their golden blood removed on a table, with straps in place for directors of their gold desks, and hot pokers applied by coalition forces to extract their gold, the outcome dictated by incredibly insolvency and margin call vulnerability, the effect on the gold market would be magnificent. Such events are in progress in my opinion, based on some juicy information feeds. Rather than divulge the entire details of the cartel kill, the coalition prefers to move to the next victim in the Wall Street & London cesspool of finance. What follows will not be presented in great detail. That is saved for the Hat Trick Letter reports, where research has come across magnificent events in progress. As the calm spreads like a fog over the financial sphere, the level of risk rises. As the phony recovery stories propagate like a disease from the host, the level of risk rises. As the US political race takes center stage and the stakes increase, the level of risk rises. Events are catapulting in a loose coordination that is very difficult to observe, except for the quicksand in Spain. The subprime cancer has returned. The struggle to revive the credit engines has drawn the weaker elements into the room. Banks wish to lend more. While few players qualify for loan approval and partnership grants, the banks themselves have never been more insolvent. Without the FASB accounting largesse and generosity, all large US banks would be declared insolvent and prepared for liquidation proceedings. The junk bond warning lights are flashing. The movement to even remain standing still has come with greater risk assumed and embraced. The anti-USDollar forces gather strength. The emerging nations had been making numerous significant bilateral agreements a month ago. The Iran oil deals had dictated some degree of innovation in payment systems in response. The sanctions forced their hands. Additional sanctions like usage of SWIFT bank systems as a weapon, threatening usage in Europe, resulted in a flash point. The BRICS nations, led by China, appear to be on the verge of launching a rival SWIFT bank procedure that might be critical in trade settlement. It is likely to be outside the US$ setting. Prepare for the possibly sudden cardiac arrest event to the Petro-Dollar. In April 2010, a major conference took place in Abu Dhabi among Arab royals. They arrived in unmarked jets, over 200 strong in number. They struck important accords, including the reliance upon Russia and China in the security role for the protectorate. In essence, the Saudis worked to replace the United States in the protection racket that has endured since the 1973 embargo, manifested in trade surplus recycling, even as the Germans worked to establish the Eastern Alliance. If a new SWIFT system comes, then the foundation will be set to walk away slowly from the Petro-Dollar. Few see the pieces coming together. The impact on the USEconomy would be something between a wrecking ball and catastrophic. China prepares to wrest control of the USDollar, for the stacks of reserves held outside the US boundaries. This is history in the making. If a Chinese USDollar is launched, and trades independently of the domestic USDollar, then it is Third World curtain time for the United States. The practical effect would be rampant price inflation from a devalued domestic Dollar. It would be rampant shortages, since the restated Dollar would not be a favored piece of paper, not with tremendous economic weakness, absent industry, insolvent banks, ruined states, bond fraud charges in every nook & cranny, war cost impact, and the big storm cloud of the runaway USGovt deficits which could tack on another $200 billion in March. The path is clear, which begins with over 50% in external held debt, then lost sovereignty, then foreign voices influencing key decisions, then wearing down the muscle mass of tools like the IMF and World Bank, and finally lost control of the global reserve currency. Never in history has a nation had control of its currency wrested by another nation. The reaction process by foreign entities to the USFed and USDept Treasury abuses to the USDollar in hyper monetary inflation have wrought vengeance at worst and survival tactics at best. Germany has made preparations to leave the Euro currency union. The more accurate statement should be that Germany is preparing to take the Euro ball out of the park, to improve it, to sign new free agency team members, and to leave the Southern European nations to fend for themselves in a sandlot. The Latin remnant will be essentially bagholders left with the gristle, fat, and toxic matter of the Euro currency itself. What they hold onto will be devalued in a fast moving storm. The risk to Germany will be the opposite. They must sign up enough new trade partners so that whatever new currency (Nordic Euro, New Marc, Euro Mark) is not a victim of its own success. A fast rising new currency would inflict damage on the German export trade. Numerous financial safety nets have been created and loaded, designed to aid large German banks. Some might fail. Spain is on the verge of rejecting the austerity measures and maybe the Euro currency. Refusal to swallow the poison pill might have some benefits, like not pulling the rug from under the economy in vast spending cuts. But the reality bites hard, as the Spanish Govt Bond yield will revisit its old high levels. Funding problems will become acute. Think NO WAY OUT. The 23% jobless rate in Spain is written like an unusual figure in the West, but it equals the United States. The US simply has better liars in the economic trenches and more thorough press control. The strain in Spain will likely rain chaos on the bond plains, sufficient to cause their leaders to show disdain for remaining within the strained Euro domain. The USFed and Euro Central Bank are guilty of $5 trillion in paper binges in the last several months alone. The US Federal Reserve and the European Central Banks are operating like desperate siamese twins in the frantic rescue attempt to prevent a Western banking system collapse. ECB head Draghi might have expressed reluctance to trade in bad PIGS debt paper, but he has been the champion in EUR 3.1 trillion in window activity over just the last six months. Notice nothing is fixed despite the massive effort that has been no more than glorified paper mache application. It is a futile battle akin to the task of Sisyphus, who was forced to push a stone uphill, but every time he rested, it rolled back down the hill. Since the central bank paper merchants can only apply paper bandages to the paper wounds, the rotten limbs and appendages cannot distinguish between the old rot and the new fester that begins immediately upon treatment. Nothing is fixed, no remedy in place, none even attempted, nor is recognition of the problem part of the debate. The US financial markets have become an abandoned playground left to the High Frequency Trading freaks and their cadre of corrupt video game ilk. Volume is way down on the NYSE. Fund outflows are magnificent for stocks, as the public aint so dumb after all. ETF-type congames are losing their appeal. As the LTRO effect wanes from central bank paper shell games played at windows, the financial markets are experiencing a vast low pressure zone. The windows will eventually all be shattered. The US housing market is permanently destroyed. The Jackass has played word games since 2007 calling for a two-year decline. But my call has been repeated every year. Let the forecast be made in more plain terms. The US housing market will never come back. Its decline will go hand in hand with the deterioration of the USEconomy and lead the nation on the path to a USGovt debt default, accompanied by over 25 individual State defaults (called another name in legal parlance). The foreclosure parade is unending. The delinquencies mount unabated. The decline in home prices puts new household ranks into negative equity territory, exactly as Greenspan warned a year ago. What irony that the chief architect also acted as the Cassandra in warning. The banks refuse to liquidate, since doing so would expose their insolvent ruin and inflict even more deadly downdrafts in home prices, as well as expose the vast corruption among bonds, from false property titles to duplicate title usage to outright bond counterfeit, even to raids by past presidents. The hidden factor in the systemic ruin was the China card played in the last decade. The decision to send US factories to Asia, starting in the 1980 decade with Intel to the PacRim, followed by a climax to China in the 2010 decade, will serve as the basis of a chapter in history that led to the US systemic ruin. The gold card was played within the Most Favored Nation status deal granted in 1999, since the Rubin team ran out of US gold, ran out of European gold, and needed fresh gold meat. The Chinese committed their gold hoard and promised to recycle trade surplus, just like the Saudis did with oil money. The Gold Carry Trade began but did not end with Fort Knox raids. The carry trade is the singlemost financial factor that pushed the nation to ruin. Nothing backs the USGovt debts, not with an empty Fort Knox, never to be audited, the home of nerve gas storage if truth be told. The deep storage gold on the USGovt balance sheets does not fool many people anymore, the subject of ridicule. The US is insolvent without collateral, facing a margin call, soon to lose control over its own currency. American life savings are at risk, while pensions have been gutted, but the sirens are silenced. Since October, the pressure has been squarely on the US and EU central bankers to print money, to direct it to insolvent giant banks, and to prevent a collapse. They reacted to sovereign bond pressures. But at the same time they had to exert extreme force on the gold market, so it did not reflect the extreme debasement of money itself. Thus the huge naked short ambushes of gold. But during these past six months, a new coalition has emerged to exact a heavy cost on the gold cartel. They will lose one additional cartel member to the gold war battlefield with each and every illicit paper ambush. A big order is being filled in the last two weeks, a very big order, at a low price, by brute force. The result will be another dead cartel member. Its completion will be followed by another nice price rise. Whether the cartel is willing to lose another member bank afterwards as the cost of yet another paper ambush, hard to know. But the unshakable fact is that the global monetary system is being ruined. The confidence in sovereign bonds is at rock bottom. In Europe it is more clearly in the open, but in the US it is more hidden, as the safe haven ruse plays on. Somehow a $200 billion single month deficit for the USGovt credit card line does not juxtapose well with any claim of being a safe haven, no more than a metal flagpole is during a lightning storm. The biggest buyers of the USTreasury Bonds are the USFed and its handy printing press, used and abused frantically and at high volume speeds. 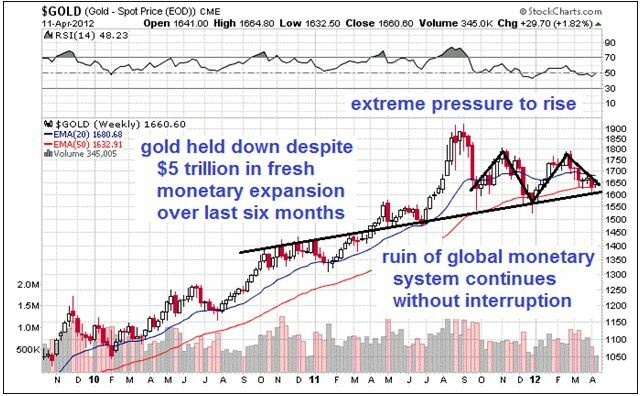 Distrust of the monetary system will bring about the rise of a new system, backed by gold. However, the old system cannot be permitted to fall unless and until the new system is ready, in place, and fully wired. That day is coming soon. The signposts are in place, the painted messages legible.